Immigration Debate In Congress Riles Up Texas Republicans : It's All Politics In a state with a fast-growing Latino population, the fight over immigration is especially relevant. There's scant backing for the Senate's immigration bill among Texas Republicans in Washington, but some Texans say those lawmakers are "behind the curve." Republican Sen. John Cornyn of Texas delivers remarks during a Senate Judiciary Committee meeting to work on the immigration legislation in May. All this week, NPR is taking a look at the demographic shifts that could shake up Texas politics in the coming years — and what that could mean for the rest of the country. Within a decade, Hispanics are bound to become the largest ethnic group in Texas. These often Democratic-leaning Texans could reshape the state's GOP-dominated political landscape. The immigration bill that the Senate approved last week is seen by some Republicans as a chance for their party to win support among Latino voters. But there's scant backing for the bill among Texas Republicans in Washington. Republican John Cornyn, the senior senator from Texas, is seeking re-election next year, but he does not seem to be seeking the votes of many Hispanic Texans who want an immigration bill passed this year. 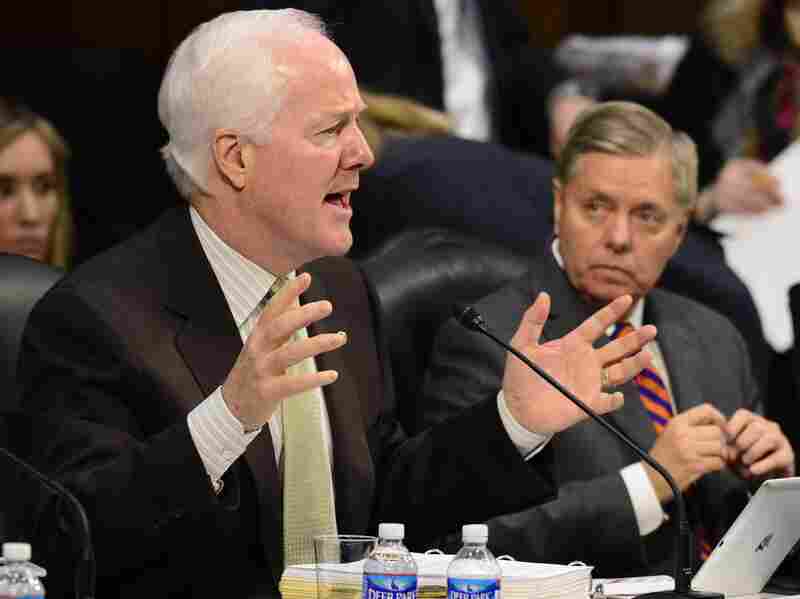 "I would love to support an immigration reform bill," Cornyn said last week on the Senate floor. "Unfortunately, the way this bill is shaping up, I cannot and will not." The junior senator from Texas, Ted Cruz, is the son of a Cuban immigrant, but he strongly opposes the path to citizenship for 11 million unauthorized immigrants in the Senate bill, which he voted against. "I think we need to treat legal immigrants fairly, and I think granting a path to citizenship is not fair to legal immigrants," he said. Most of the two dozen Texas Republicans in the U.S. House take a similar hard line on immigration. Rep. Joaquin Castro, a Democrat from San Antonio, said his Republican colleagues are ignoring the will of a majority of Texans. "Most Texans favor comprehensive immigration reform," he said. "I've been very disappointed that Sens. Cruz and Cornyn have not been leaders on this issue." But Rice University political scientist Mark Jones said it's no surprise those senators oppose the immigration overhaul. Cruz, he said, is a Tea Party renegade who has long opposed a path to citizenship, while Cornyn could face a primary challenge from the right and lose his job. "The border probably will never be secure enough for Ted Cruz to support comprehensive immigration reform," Jones said, "whereas John Cornyn wants to be able to show that ... he's still a hawk on immigration by being a staunch supporter of border security." And that worries some prominent Texas Republicans who support the immigration bill. "These folks are about 10 years behind the curve," said Richard Land, a longtime leader of the Southern Baptist Convention. "They need to get out more and talk to their constituents and read the polling." Still, in the heart of Texas' Bible Belt, it's hard to find much love for the immigration bill. At a meeting last month of the Parker County Republicans in Weatherford, Texas, a local man named Howard Story said all Congress should do is fix the porous border, which he said is "bad enough that we should bring in the military to secure it." When asked what should happen to the 11 million already in the U.S. illegally, he said: "Deport them." Another local GOP activist, Judy James, acknowledged that more and more voters in Texas are Hispanic. Still, she said she believes many will become Republicans. "The demographics are changing, but there are a lot of them — Ted Cruz and family, for instance — who are very definitely conservative because they see what's going on," she said. Indeed, one House Republican from Texas thinks backing the immigration bill in hopes of winning more Latino votes could prove self-defeating. "You think we're going to get Hispanic voters to come to a party that they know is purely pandering?" asked Rep. Louie Gohmert, who represents East Texas. "I think there's a better chance of having them vote for Republicans if they see that, above all, we're about honesty and integrity, and we're following the rule of law. We want to keep a country where people will continue to want to come, and if you get overwhelmed with a billion people that would like to come, at some point, you got no country left." But Rep. Ted Poe, chairman of the House Immigration Reform Caucus, said there needs to be an immigration bill, and "Republicans in the House need to take the lead." "It's important for Texas because we have so many Hispanics," he said. Jones, the Rice University political scientist, thinks Poe is on to something: "The real fear of Republicans is a perfect storm — whereby immigration reform legislation isn't passed [and] Democrats are able to use that issue both to siphon off Hispanic support that used to vote Republican, as well as mobilize new voters to come to the polls. And that could spell trouble for Republicans." Especially if they're from Texas.